Anita did not have a female companion to train with or to compete against, so she trained with her brother and other male practitioners of martial arts. Five seconds into the fight, Anita Karim — who had stepped on to the octagonal mat for the very first time after only one year of training — confidently landed her left hand on her opponent’s face, throwing the experienced Nyrene Crowley off balance. The far more experienced Kiwi fighter was taken by surprise. She spent the entire first round defending herself against Anita’s powerful strikes. It was in the final seconds of the initial round that Crowley came back to her senses and threw Anita on the floor. The inexperienced Anita found it a bit tough to fight on the floor. Her opponent exploited this, and got her in a rear choke in the second round. Anita lost the fight... but had made it abundantly clear that she was here to stay. 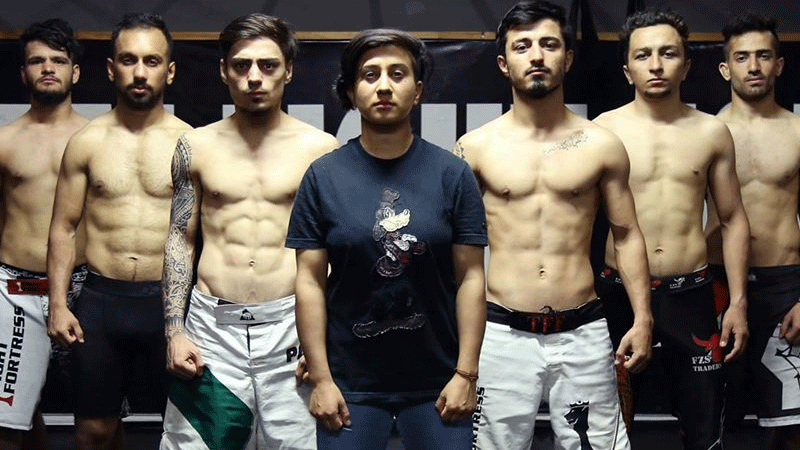 The first ever female mixed martial arts (MMA) fighter of Pakistan, who started practicing taekwondo at an early age in Hunza with her brothers, is not disheartened by the defeat. She is determined to learn from her mistakes and get back to the ring stronger to walk off as the winner one day. “It was all about experience, they were not differently trained,” says Anita. “The jabs, the crosses and the kicks are all the same, it is just about implementing them. I have to focus a bit more on these things,” she says. MMA is still a growing sport in Pakistan and not so popular among the female population of the country. Anita did not have a female companion to train with or to compete against, so she trained with her brother and other male practitioners of martial arts under the supervision of the well-known trainer, Ehtisham Karim. 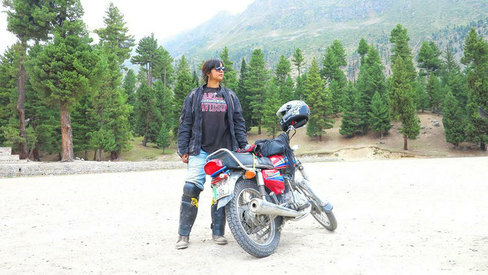 When she arrived in Islamabad from Hunza, she was given a choice between higher studies or a professional MMA career. She picked the latter, despite knowing the challenges. Anita Karim is Pakistan’s first and only international female practitioner of mixed martial arts. Her rise has been as much about her determination to take on a male-oriented society as her dedication to hard work and training. 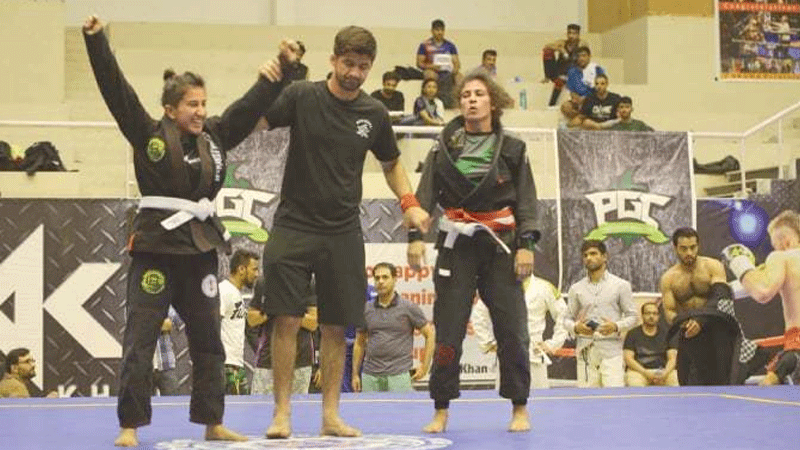 “Before getting her into MMA, we trained for a few days so that she could understand how it feels when you are punched in the face,” says Ehtisham, who is himself an established MMA fighter in the country. Training with her male counterparts has not been easy for Anita. She never misses her training and is one of the most hardworking individuals at Ehtisham’s gym. “I wanted to beat the stereotypical thinking that girls are not strong enough,” she says. Despite being the only girl training at the gym, Anita does not get any leverage. In fact, while fighting against men in practice matches she gives them a pretty tough time. “We don’t worry about things such as hitting her lightly during training. If we are soft on her now, she will get thrashed in her fights. No one likes to be beaten, but when Anita punches me during training, instead of getting angry I am glad. I tell her that it is how you connect blows,” Ehtisham says. On her way to becoming one of the top fighters of the world. But training with male counterparts was not the only challenge that Anita initially faced. She had to fight another battle: the battle against society. The good thing about Anita was that she never took her criticism seriously. She knew her parents and brothers were on her side, so she did not pay any attention to the demoralising words. Having athletes in the house was nothing new for the Karim family. Ehtisham’s wife Malika-i-Noor is the vice-captain of Pakistan’s football team. She has also gone through this phase when she started playing professionally. 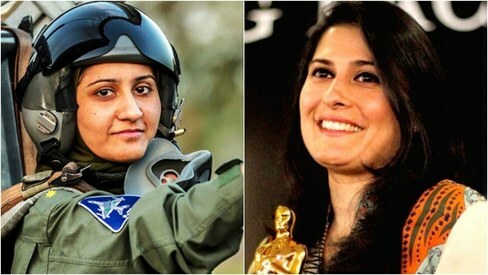 Samina Baig, the famous mountaineer, too hails from the same village as Anita’s. She was also her role model. Anita used to train around eight hours a day with a little rest in between. The training made her immensely strong and skilled. She participated in a tournament held in Islamabad in April where she won two gold medals and earned the award for being the best athlete, along with the nickname of “the arm collector” because she broke two of her opponents’ arms. Ehtisham believes Anita has got the germs to become the best in the business. Her work ethic, determination and confidence are noticeable. He is extremely proud of her despite the defeat in her debut fight. “Being the first international female MMA fighter [from Pakistan] is admirable, I am super proud of her,” he says. Anita’s confidence sets her apart from both her male and female companions. There have been girls getting MMA training in different parts of the country but they have not fought in an octagon ring so far. Her coach believes that if Anita keeps working the same way and stays humble, she can become one of the top fighters of the world. Uloomi also believes that she can reach the top of the game, which is where he wants to see his sister. Nobody mess with her, unless you'd want your bones broken. We are very Proud of you my Sister!! Wow. Simply wow. 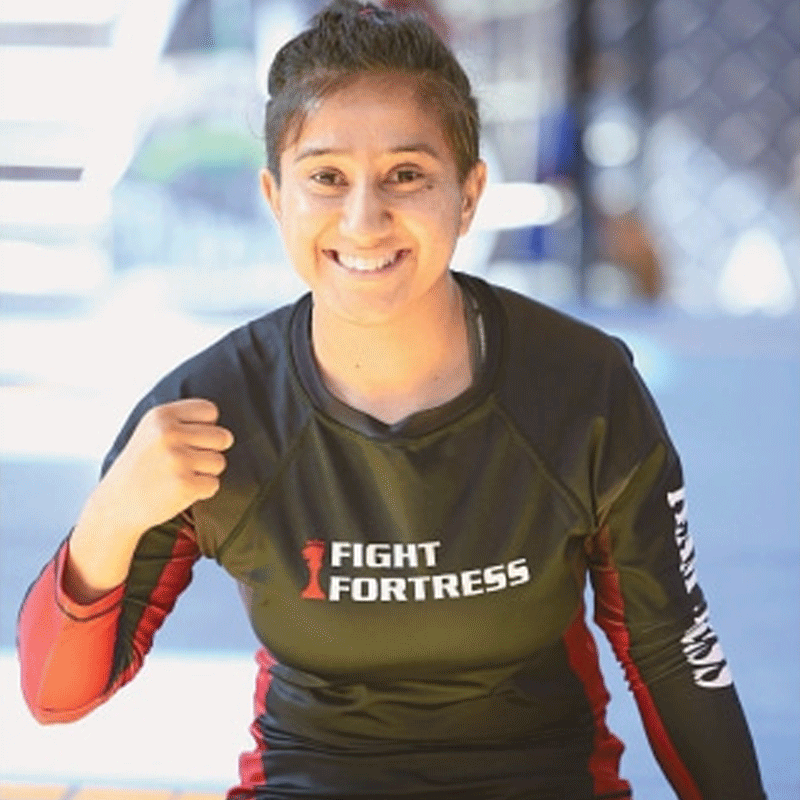 Despite the odds of being a female MMA fighter in Pakistan Anita has prevailed. She needs to go into the womens army, navy, airforce and police to inform and recruit. She needs to visit schools and colleges to inspire and and win girls to join the sport. When women of a nation become strong, it's children become strong and it's men begin to learn respect and learn responsibility. Simply wow! Amazed by her persistence and hard work. Anita Karim is an inspiration to all girls who can now dream of being whatever they want in life. 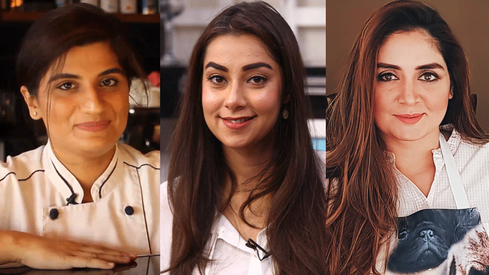 Pakistan is so fortunate that the women in Pakistan are making waves in most fields that they could not enter!